I've been a fan of Zechariah Sitchin's ideas for many years, and am so grateful you have taken up the gauntlet he threw down! I have wondered how the Annunaki on their home planet could have developed crops and animals for planet Earth with its particular sun. I could not have imagined that a mostly red light from a brown dwarf could promote the same sort of photosynthesis as our sun provides. But here is an interesting link about Kimbal Musk, Elon's brother, and his hydroponic-like effort at food production (2). I was impressed that the shipping container farmers use PINK light to grow their produce--because photosynthesis only needs the blue-red part of the light spectrum!--something of which a brown dwarf might provide plenty, even more efficiently than our own sun. The availability of large bodies of water on the surface to buffer the extremes of dark and light side temperature differences. Then there's the issue of whether life can actually get going on the orbiting planet. It seems likely, from what we know from conditions on Earth, that extremeophiles will find a way, and anywhere that water can exist is likely to promote life of some description. But what about planet life? Does this not require the light of the Sun, or similarly bright star? Brown dwarf light is red, not yellow. Can photosynthesis work in such a system? This particular light colour provides the optimum light input, saving energy and money, and allowing companies to grow plants, such as tomatoes, in the winter. These cooler lights can also be placed much nearer to the plants than traditional sodium lamps usually used in greenhouses. As a result, the blue and red combination of LEDs can be placed very close to the plants, providing multi-directional lighting, and so optimising growth. 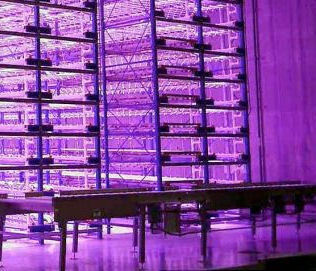 The innovative use of pink light is extending and improving hydroponic systems to grow vegetables like lettuce very efficiently. 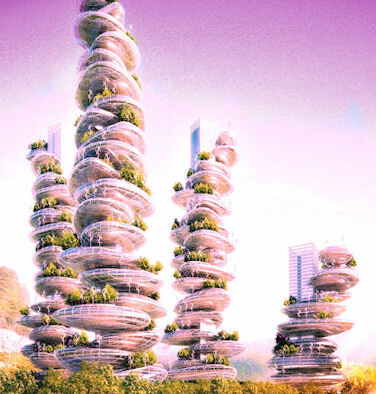 This is being combined with architectural innovations to create 'vertical farming' facilities (4), like Plantagon's sixteen storeys-tall World Food Building project in Linköping, Sweden. 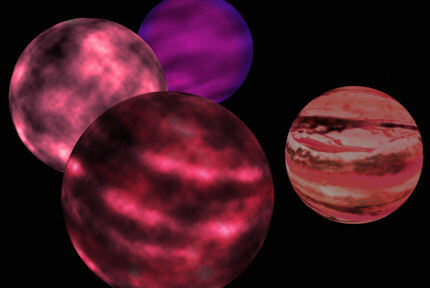 As one moves through the stellar spectrum from brown dwarfs to sub-brown dwarfs, the colour of the 'star' cools from red through magenta towards purple, exhibiting different colours in the infra-red range (5). Closely-bound planets within a small brown dwarf's system are likely to be warmed by both the direct infra-red emission from these objects, as well as the internal warming caused by proximity to this massive object. 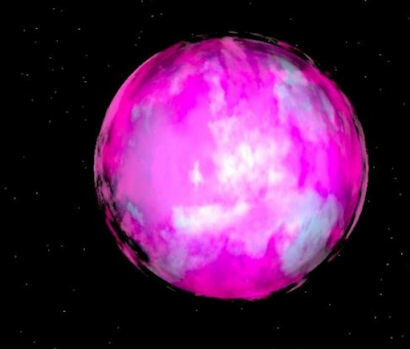 This may create an habitable environment where the pinkish light of the small brown dwarf provides sufficient energy to drive efficient photosynthesis. This could then provide the basis for a complex food chain. If this kind of Dark Star system exists in the depths of our own solar system, then complex surface-based alien life is possible on our doorstep. Could this be what the Anunnaki's homeworld looks like? The origin of these dense, hot stars, whose metallicity is totally overblown, is mysterious indeed. Might these objects be examples of the residue of stars pulled apart by the black hole at the centre of the galaxy, and spat out into the Milky Way? This mechanism has been used to explain violent events observed occurring close to the galactic centre, the results of which may produce a stream of free-floating planets cast out into the wider galaxy (3). Such a mechanism may, therefore, potentially account for interstellar sub-brown dwarfs, and smaller gas giants, which may, on occasion, brush close to or through the solar system. In February, I reported on an invitation to join in the hunt for the elusive Planet X object, now referred by many astronomers as Planet Nine. Members of the public were ask to pore through millions of images of the night sky, to literally hunt for a planet needle in the stellar haystack. This group effort was conducted on the Zooniverse internet platform, and proved tremendously popular (1). Anyone with access to the Internet could access the images to try and identify changes occurring over time in the fields of view. All solar system objects are moving across the sky, and their rate of movement is a function of their orbits around the Sun. Over time, then, dim objects reflecting light back to us from distant parts of the solar system might be seen to move across the field of view. There are potentially a huge number of false positives here, which need to be eliminated. Humans are potentially better at this than computers, no matter how well programmed. By sifting through the observational junk associated with these kinds of sky searches, it is hoped that new objects might be identified for study. 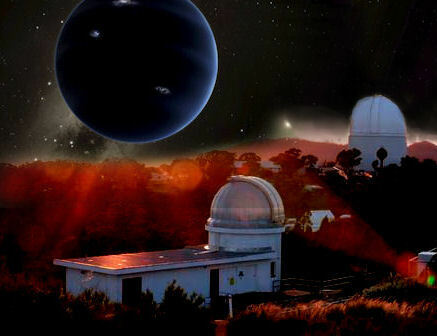 This might allow astronomers to focus in on candidate objects for further study, and perhaps even reveal the existence of the mysterious Planet Nine (2). Towards the end of March, a second similar effort was launched by the Australian National University (ANU), this time covering the southern hemisphere and using data from the SkyMapper digital sky survey (3). The observational data in this survey had been supplied by the SkyMapper telescope at Siding Spring in Australia. Again, the uptake among volunteers over the Internet was incredible: 60,000 'citizen scientists' made over four million classifications in just three days. This was the equivalent of four years of scientific analysis by dedicated professional astronomers (4)! The upshot of this tremendous group effort was that ANU's team think they may have identified four possible candidate objects. This effort also managed to throw out two known bodies from the SkyMapper data - minor planets Chiron and Comacina - showing that the methodology was working effectively. In an interview with the BBC, ANU's Brad Tucker said: "We've managed to rule out a planet about the size of Neptune being in about 90% of the southern sky out to a depth of about 350 times the distance the Earth is from the Sun" (4). This is relatively unsurprising, as Planet Nine is thought to lie further out, beyond 600 Astronomical Units - which is at least twice this distance. Although there was a warm welcome from Caltech's Mike Brown for this Australian effort, and others like it, SkyMapper's maximum resolution may be a sticking point. It is probably incapable of actually detecting Planet Nine. Dr Brown's colleague, Konstantin Batygin, notes that if Planet Nine was nearer to perihelion at the moment, and so therefore within the parameters of SkyMapper's search capabilities, then the elusive planet would have also gravitationally affected the outer planets sufficiently for probes like Cassini to have noted subtle changes in Sayurn's position over time. The astrometry data from Cassini has not flagged it up, which indicates that Planet Nine must be closer to the furthest point along its 20,000+ year orbital cycle (5). Given the shared identity between Australia's ANU and the ancient Sumerian sky-god of the same name, perhaps an ancient Sumerian name might be more appropriate. So how about Nibiru McNineface? 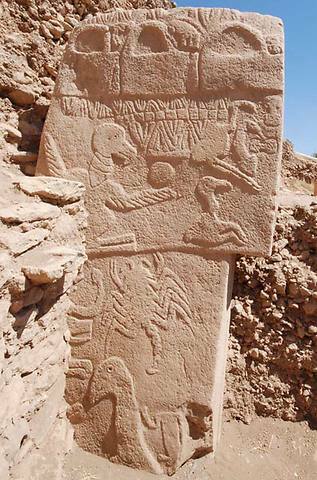 "...When engineers studied animal carvings made on a pillar – known as the vulture stone – at Göbekli Tepe they discovered that the creatures were actually astronomical symbols which represented constellations and the comet. The idea had been originally put forward by author Graham Hancock in his book Magicians of the Gods. On the face of it, this seems strong evidence. But this kind of analysis is heavily contested, and the paper has been subject to a feeding-frenzy of debunking in the comment sections of online reports (4). Reporting of this paper has made its way into the science pages of mainstream media, which has aggravated a number of academic commentators. They don't consider these hypotheses to have any real grounding, and are unhappy that these ideas have been picked up by science editors sifting through Press Association releases. Shouts of 'Pseudoscience!' will be ringing in the ears of our Scottish engineering friends for some time to come. I wrote about this quite a bit last year (6). I speculated further - suggesting that this comet impact event could well be connected to Sitchin's Nibiru transit, which the late author had pinpointed for that time (7). Sitchin would have been excited by this new paper, bringing archaeology, astronomy and engineering together. This kind of multi-disciplinary approach will always fall foul of purist academics, whose own fields of expertise are jealously guarded. At least some in academia are brave enough to challenge this, and attempt to piece together a puzzle that could just make the prehistory of our human existence a little more understandable. Coherent catastrophism is a theory put forward by Clube and Napier, arguing that the planetary zone of the solar system occasionally plays host to large, long-period comets which fragment, creating broad, dangerous debris fields across the inner solar system (8). This, in turn, increases the incidence of meteorite bombardment upon planets like the Earth, as they cross the debris fields. The Taurid complex is most closely associated with prehistorical extinction events, according to Clube and Napier's theory (9). This theory stands as an alternative to a catastrophic event associated with a 'Planet X' body, which I tend to favour as an explanation. 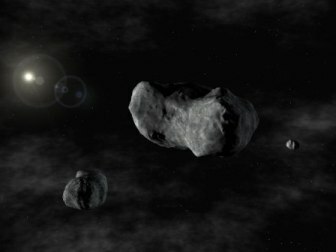 A number of the planets in the solar system have 'Trojans', which are hangers-on asteroids orbiting along the same path. These asteroid cluster sit in stable points of the orbit known as LaGrangian points and may be located ahead of the planet (leading 60 degrees, known as L4), or behind it (trailing 60 degrees, known as L5). Planets known to have populations of Trojans include Venus, Mars, Uranus and, particularly, Jupiter, which has a very significant number (about 6000!). Earth has at least one Trojan, and maybe more. It's difficult to know about anything in residing in Earth's metastable L3 LeGrangian point because, at 180 degrees, it is located on the diametrically opposite side of the Sun, so always beyond our view from Earth (a small version of the 'planet behind the Sun' myth, potentially). Even the more stable L4 and L5 are difficult to view from Earth as they tend to be only viewable at sunset and sunrise. So, these parts of Earth's orbit need to be observed by spacecraft sent out into the solar system to get a better vantage point, like OSIRIS-REx (1). "True Trojans come from the material that was present when the planets were formed, says Apostolos Christou at the Armagh Observatory and Planetarium in the UK. “The Trojans are really a relic from the early life of the solar system, when the planets were still forming." In 2013, he was studying a Mars Trojan nicknamed Eureka when he spotted a group of asteroids accompanying it. They all seemed to occupy the same area in Mars’s orbital path, which was strong circumstantial evidence that they shared a common ancestor. Olivine forms within the mantles of larger planetary bodies, implying that Eureka was once part of a much larger rocky entity. It may have been chipped off one of the known planets (including Mars) following a catastrophic collision, or it might signpost us to a prior planetessimal, or planet, in the early solar system or planet, long since destroyed, lost... or missing. The realisation that the Earth's water share much in common with asteroids, particularly those located in the outer asteroid belt, suggests a common origin. Perhaps the Trojans collected by Jupiter and Mars may similarly signal a catastrophic origin for the objects in this sector of the solar system. It seems increasingly likely that all of these factors may be tied together, awaiting the discovery of the crucial missing piece of the jigsaw.